Death is a fact of life, and grief is a necessary part of healing. The grief process does not end at the burial, the funeral service or the closure of the traditional, three-day bereavement leave as defined in the bereavement policies of most companies. 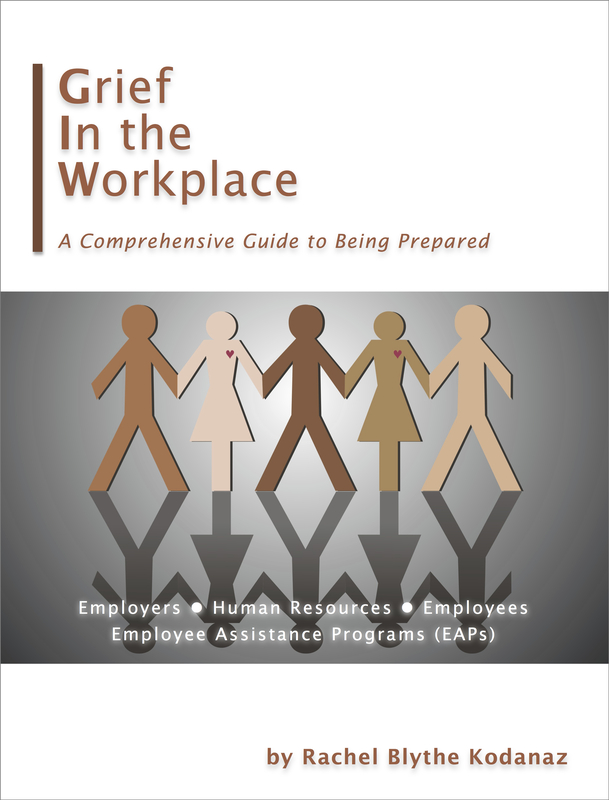 This handbook is designed as a guide for Human Resources personnel, EAPs, managers and co-workers who are supporting a fellow employee when s/he is grieving a significant loss or if the work group is mourning the loss of a co-worker. Whether it was an employee who died, or a close loved one of an employee, allowing healthy grieving time will ultimately produce a stronger and more stable work environment. The maturity gained through positive grief resolution will result in deeper appreciation of life, greater commitment to work and positive changes in lifestyle. The idea of writing and speaking on Grief in the Workplace was a direct result of my experiences while I was grieving my personal loss. When my husband passed away unexpectedly, I was a member of management in a large corporation. It took me several years to realize that if my employer and co-workers were educated in the grief process, my grief experience may have had a different outcome. I struggled with making decisions, expressing my thoughts and resolving unnecessary insurance and financial challenges. Important insurance and beneficiary paperwork fell through the cracks; my manager and co-workers did not know how to address my situation; and my productivity was significantly lower compared to before the loss. After spending several years recovering and helping other grievers, I began researching how to help employees who are grieving in the workplace. I found very little material on the subject so I began writing. I published the first version of Grief in the Workplace in 1998. That led to writing a column for ten years titled, Grief in the Workplace for Bereavement Magazine (now Living with Loss), speaking nationally on the subject and appearing on Good Morning America. In 2013, I published Living with Loss, One Day at a Time (Fulcrum Publishing) offering daily encouragement to individuals and families who have lost a loved one or are suffering from any form of loss. The 365 daily lessons and thought-provoking ideas provide hope, optimism, introspection, and self-discovery. The book has proven to be a valuable tool supporting an employee or workgroup with their individual journey. In summary, I am an advocate for educating the workplace, specifically managers, co-workers and Human Resources specialists, on key aspects of grief. This variety of training reduces the recovery time necessary to address grief, resulting in a more positive and productive work environment. Rachel Kodanaz is an author, speaker and coach who provides support to workplaces when there has been a death of an employee or when an employee has experienced a personal loss. She is the author of Grief in the Workplace and Living with Loss, One Day at a Time. Both are available at rachelkodanaz.com or amazon.com.